After a brief birthing period on southern Main Street, the Ridgefield School for Boys moved to a 115-acre campus on North Salem Road, north of Lake Mamanasco. 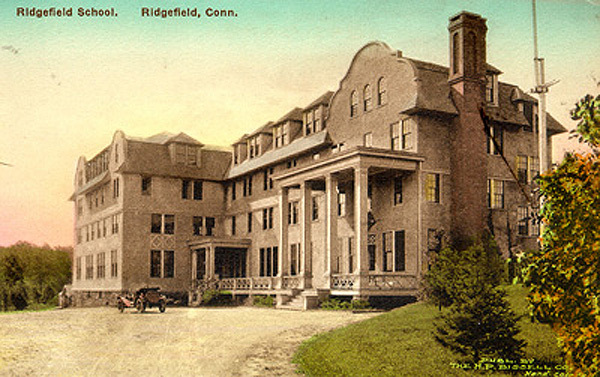 Here, the school operated under headmaster and founder Roland J. Mulford until 1922 when Theodore C. Jessup took over. He remained until 1933 and the school lasted until 1938. The building above had more than 100 rooms, including classrooms, dorm rooms, and offices. It was built in 1911. After the school closed, Francis D. Martin purchased the property and chopped the top three stories off the building. Today, part of the main floor still exists as a private home. Among the more noted graduates of this school were Philip C. Jessup, former judge of the World Court and a United Nations ambassador; John Gilbert Winant, a governor of New Hampshire; Walter Devereaux, a president of the New York Horse Show; Frank Schoonmaker, a wine expert; William Dodd Brewer, an ambassador to The Sudan; and Pinckney Tuck, U.S. chargee d'affaires in Paris after the outbreak of World War II. Scans and enlarged reproductions of all our postcards are available. See the Index Page.